With low cost airlines, going for a dream vacation at economical rates is easy now. Also called as budget airlines and discounted carriers, these cheap air flights offer great deals to the customers and convert their longing for air travel into realty. So, take the advantage of cheapest airfare on these low cost carries without any delay. EaseMyTrip is a source to find cheap deals on Low cost airlines for your preferred destination in India. With its user-friendly search engine, grab lowest flight fare for your next holiday and enjoy a hassle-free journey. For any other query, call us and may be you are the lucky one to get great discounts on holiday packages, car rentals and hotels. If you are not aware about the key differences between low cost airlines and full service airlines offering lowest flight fare, EaseMyTrip is going to provide detail information of the same. Low cost airlines offer relatively less facilities in compare to full service airlines. Low fare airlines don’t offer any in-flight entertainment, news papers, magazines and free meals. For any extra comfort like food, water, pillow and blanket, passengers traveling with low fare airlines have to pay extra. LCCs allow the passengers availing lowest flight fare and cheap air flights without giving any option to reserve particular seat of their choice before boarding. Early reservations in low fare airlines allow the passengers enjoying lowest flight fares but airfares increase as soon as the seats fill up. Why No Frill Airlines are Cheaper? Air India Express offers great deals on air tickets. Book a trip with this Indian low-cost airline. Jet Konnect is a low cost airline of Jet Airways offering lower airfares on flight tickets. 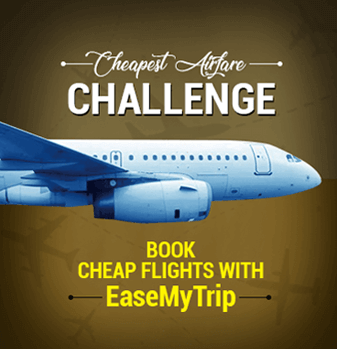 Book you flight tickets soon with EaseMyTrip and enjoy GoAir flight. Fly to your favorite destinations find IndiGo flight offers here. Fly to your favorite destinations at reasonable rates. Book cheap Air Asia flight tickets at EaseMyTrip.com.